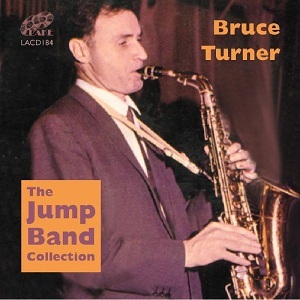 Bruce Turner formed his Jump Band in March 1957 following his departure from the Humphrey Lyttelton Band where he had been playing since 1953. He wanted a different sound, one that reflected the tight-knit, highly organised sounds of the John Kirby, Benny Carter and Johnny Hodges small groups to which he wanted to add the exciting sounds of the big bands. The Jump Band was not an instant success, Turner himself claimed they were unemployed for two years and their first recording made in 1957 was not released until 2003! The group started as a quintet with the bebop trumpet of Terry Brown joining Bruce but the band did not achieve a full sound until a trombone was added later. The band did successfully capture the swing small-band sound and the skilful arrangements, played with great precision, often made the group sound much bigger than it actually was. The band continued until 1964 making their last record in 1963 although they continued to re-form for one off events and made an appearance on BBC Jazz Club in 1982 with most of the original band present. Terry Brown (tp), Bruce Turner (cl,as), prob: Colin Bates or Al Mead (p), Danny Haggerty (b), Billy Loch (d). Broadway*/In A Mellow Tone*/Topsy*/Softly, As In A Morning Sunrise*/Northwest Passage*/Terry's Blues*/Ballad Medley* (April In Paris, The Nearness Of You, Our Love Is Here). Terry Brown (tp), Bruce Turner (cl), Al Mead (p), Danny Haggerty (b), Billy Loch (d). Your Eyes*/Stop, Look And Listen. Terry Brown (tp), Bruce Turner (as), Al Mead (p), Danny Haggerty (b), Billy Loch (d). Jumpin' At The Woodside*/Donegal Cradle Song*. Terry Brown (tp), Bobby Mickleburgh (tb), Bruce Turner (cl,as), Al Mead (p), Jim Bray (b), Rex Bennett (d). Down South Camp Meetin'*/Stop, Look And Listen*/One O'clock Jump*. John Chilton (tp), John Mumford (tb), Bruce Turner (cl,as), Stan Greig (p), Tony Goffe (b), John Armatage (d). Accent On Swing*/Cream Puff*/Opus Five*/Don't Get Around Much Anymore*/Stop, Look And Listen*/Christopher Columbus*/Good Queen Bess*/Nuages*/Jump For Me*/Honeysuckle Rose*/Blues For Lester*. John Chilton (tp), John Mumford (tb), Bruce Turner (cl,as), Colin Bates (p), Bill Bramwell (g-1), Jim Bray (b), John Armatage (d). John Chilton (tp), John Mumford (tb), John Picard -1 (tb), Bruce Turner (cl,as), Colin Bates (p), Jim Bray (b), John Armatage (d). Hyde Park*/Cherry*/Watch The Birdie*/Coldwater Canyon*/Opus 5*/Jump*/Knickerbocker Glory*/Roses Of Picardy*/Stormy Weather*/Clutterbuck*/Willie The Weeper (1)*/Morning Glories*. John Chilton (tp), Pete Strange (tb), Bruce Turner (cl,as), Colin Bates (p), Ike Isaacs (g), Jim Bray (b), John Armatage (d). John Chilton (tp), Pete Strange (tb), Bruce Turner (cl,as), Colin Bates (p), Jim Bray (b), John Armatage (d). Cushion Foot Stomp*/Accent On Swing*/Gone With What Draft*/How Long Blues*/A Little Bit Independent*/Carioca*/Summertime*. John Chilton (tp,vcl-1), Pete Strange (tb), Bruce Turner (cl,as), Colin Bates (p), Jim Bray (b), John Armatage (d), Long John Baldry (vcl-2). Big Noise From Winnetka (BT out)*/Jamaica Jump*/Four Or Five Times (1)*/New How Long Blues (2)*. John Chilton (tp), Pete Strange (tb), Bruce Turner (as), Colin Bates (p), Jim Bray (b), John Armatage (d). A'int Misbehavin'*/Mood Indigo*/One O'clock Jump*. Johnny Come Lately*/Donegal Cradle Song*/Lafayette*/Don't Get Around Much Anymore*. John Chilton (tp), Pete Strange (tb), Bruce Turner (sop,as), Colin Bates (p), Jim Bray (b), John Armatage (d). Goin' Places*/Nagasaki*/Plastered In Paris*/Donegal Cradle Song*/Istanbul*/Hong Kong Blues*/Helsinki*/Chicago*/Night Train To Munich*/St. Louis Blues*/Chinatoen, My Chinatown*/Copenhagen*/The Snake Charmer*/Big Noise From Winnetka*/Westminster*/Russian Lullaby*. Ray Crane (tp), Pete Strange (tb), Bruce Turner (cl,as), Colin Bates (p), Ron Rubin (b), John Armatage (d). Easy Money*/Hop, Skip And Jump*/Opus 5*/One O'clock Jump*. This page was last updated during April, 2017.